NEFYN, WALES - Just how close are you to the cliffs at Nefyn & District Golf Club in north Wales? Course Manager Patrick McAteer recalls one poor bloke years ago who stood on what is now the 11th tee and proceeded to slice 10 balls in a row over the edge. How did the player react? "He walked down the fairway, threw his entire bag off the cliff and walked straight to the pub," recounts McAteer. When researching your Wales golf trip, among the first images you'll undoubtedly come across is Nefyn & District's "The Point," a series of stunning holes set exposed on the Caernarfon Bay. Rest assured, Nefyn is better. The Point aren't the only holes here hugging the coastline. Holes two through five all tip-toe along the cliffs, and 10 holes pose the threat of a ball lost to the sea, while the remainders certainly aren't hidden from the expanse of blue ocean. Aside from this wealth of scenery, Nefyn comes with a grocery list of unique features. For starters, it has alternate final eight holes and 26 holes total. After the first 10 holes, the golfer has a choice: play the original eight holes that head out to The Point, or opt for the newer, more tournament-ready holes. Their design is more standard, but you won't be tiptoeing over any bluffs. Members these days often opt to play the new holes, but no tourist should leave Nefyn without playing the originals. To reach The Point, you have to negotiate two shocking holes. First is the aforementioned 11th hole, with a steeply elevated green. Then there is the 12th, one of the busiest holes on the planet. The tee shot is partially blind thanks to dunes on the right, though a public road crosses down the middle of the fairway (and on this day a poorly placed yellow truck sat practically in the landing zone). Balls are likely to kick left from here toward the 16th green or even the "blowhole," a massive, circular pit that funnels down to the sea. You're bound to have a gallery: a parking lot going down to the beach sits just above the green, and on sunny days pedestrians stroll the grounds seemingly oblivious to the dangers of a flying golf ball. The 13th is stunning (and easier to figure out), though winds on The Point are seldom dormant. 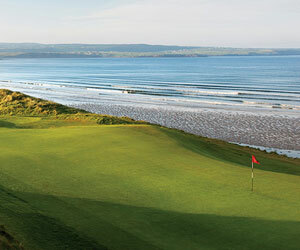 In the wintertime, waves crash in so hard here that the 13th green is often submerged in water. "You can't park your car into the wind in the parking lot," says Secretary Simon Dennis of Nefyn's vicious winter weather. "Or else you won't be able to get your door open." If that's not reason enough to see The Point, consider the Ty Coch (Red House) Pub. It sits below the 15th hole in the tiny village of Porthdinllaen, now preserved by the National Trust. Don't be nervous about a curt course marshal keeping you on pace, either. "It's assumed groups are going to head down there," assured McAteer, who says most groups simply fall back in line on the 16th tee. "Eighteen holes sometimes turn into 12 hours for some groups ..."
The 18th is straight uphill, but short enough to drive the green. You can even use the clubhouse, just steps behind the green, as a backboard. The windows, by the way, are shatterproof. It's popular to liken Nefyn & District to Old Head in Ireland and Pebble Beach Golf Links in California. Nefyn is never going to host a major championship like Pebble, and its design leaves a little to be desired: some of the green complexes are ordinary, and it's hard to take the 12th hole on the Old course seriously. Rest assured, club officials are hoping an influx of capital in coming years will allow them to upgrade the course where needed. Nearby Aberdovey and Royal St. David's are more traditional links designs. But that shouldn't deter anyone from coming here. In fact, this course should be the center of any north Wales golf trip. Nefyn's quirky charm, friendliness and scenery make it an unforgettable day. If the measure of a golf course is the many vivid memories you keep from your round for a lifetime, Nefyn scores aces. Here's another reason why Nefyn deserves its own chair in the realm of courses atop the cliffs: It's about $400 cheaper than Old Head and Pebble, with green fees just £37-45 for 18 holes. For more information on Nefyn & District Golf Club, call +44 (0)1758 720966 or www.VisitWales.com.